Hillsborough County Public Schools is committed to developing a technologically relevant and engaging learning environment for all students by providing them with the opportunity to develop the resource sharing, innovation, communication skills, and tools that are essential to both life and work in the 21st Century. Beginning with the 2014 -2015 school year, the district’s schools will offer a Bring Your Own Device (BYOD) Program that allows students to wirelessly access the Internet for limited educational purposes as directed by a teacher or administrator. Students granted access to the district’s network/Internet services from any device will be governed by Board Policy 7540.03, related administrative guidelines, and the Student Code of Conduct. For BYOD purposes, a device is any district provided or personally owned computer or electronic device including, but not limited to, phones, tablets, notebooks/laptops, wearables (e.g. Google Glass, smartwatches), iPod touches (or similar), and e-readers. With school or district staff approval, students may use their own devices at school to participate in instructional activities, access and save information from the Internet, collaborate with other learners and utilize productivity tools and instructionally appropriate apps loaded on their devices. Because personal devices will not be able to access internal district resources such as file and print servers, documents created should be saved to removable media such as flash drives or to a cloud storage location. Students who choose to bring their personal devices must use the “HCPS guest” filtered wireless public network ONLY while on campus. When logging onto the “HCPS guest” wireless network, students will be required to accept the district’s Acceptable Use Policy (AUP) for network access. All Hillsborough County Public Schools networks are filtered for the safety of users in compliance with CIPA requirements. Any attempt to circumvent safety filters or “hack” district technology in any way is expressly prohibited. Nevertheless, caregivers are advised that a determined user may be able to gain access to services on the Internet that they and/or their caregivers may find inappropriate, offensive, objectionable, or controversial. 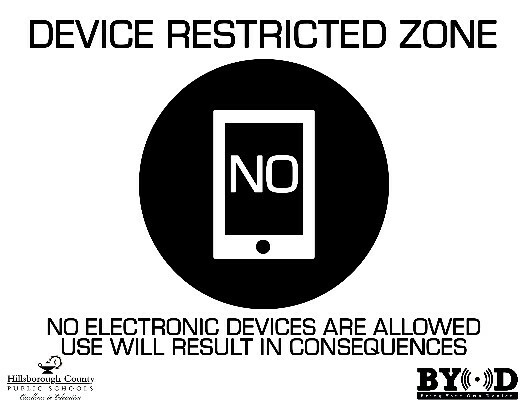 Caregivers assume this risk by allowing their child to participate in the BYOD program. Non-wireless access to the district’s network, such as through Ethernet cable, by personal devices is prohibited. Use of broadband networks, provided by cellular carriers via device or hotspot is also prohibited while on Hillsborough County Public Schools property. Know that users have a limited right to, nor should they have an expectation of, privacy in the content of their personal files and records of their online activity while on the district’s network. Access to the “HCPS guest” network is a privilege and administrators and faculty may review files and messages at any time to maintain system integrity and ensure that the users are acting responsibly. If reasonable belief exists that a student has violated the terms of this agreement, or other district policy, the student's device may be inspected and/or confiscated. Subsequent or additional disciplinary action involving misuse of technology may extend to loss of technology privileges and/or further action as determined by Hillsborough County Public Schools. 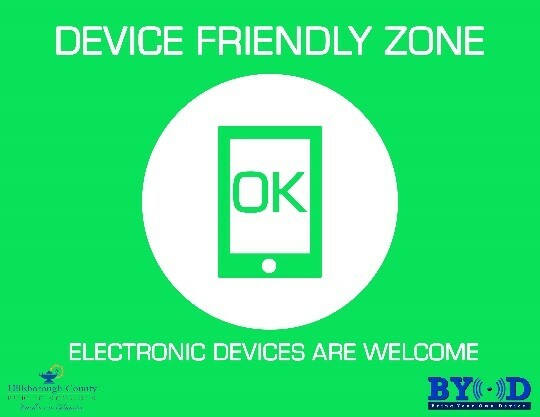 Personal devices can only be used in approved areas and students must comply with staff directives regarding the use of technology devices. Using functions on electronic devices in any manner that disrupts the educational environment or violates the AUP will be subject to disciplinary action. Audio or image recording, whether through picture or video, without prior consent of the individuals being recorded is prohibited; written parental consent is required for publication. Cell phone conversations during the school day are prohibited unless under the supervision of staff personnel. Students bring personal devices to school at their own risk. The district will not be held responsible if a device is lost, stolen or misplaced, including those that have been confiscated. Moreover, the district will not be responsible for technical support of personal devices, beyond providing necessary district specific connectivity and login information. Please make sure devices are fully charged when bringing them to school as they cannot be charged at school, unless specific permission is granted. Use of personal devices is never a requirement and will not impact student grades. In instances where a device is required for an assignment, students without a device of their own will be provided one by the district/school site. When on a BYOD school site, your student will see the following signs to help them determine appropriate device use. 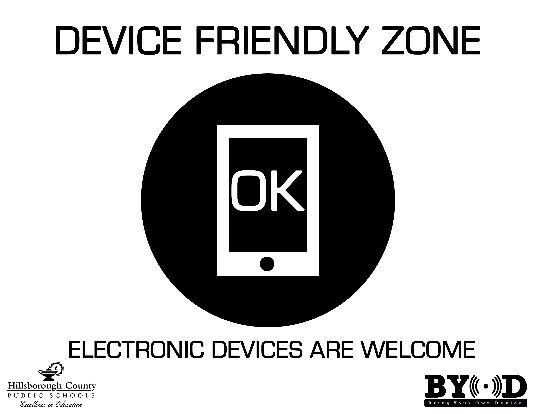 Device Friendly Zone: In a device friendly zone, students are free to use their device for educational purposes. Device Limited Zone: In device limited zones, students should secure permission prior to using their device for educational purposes. 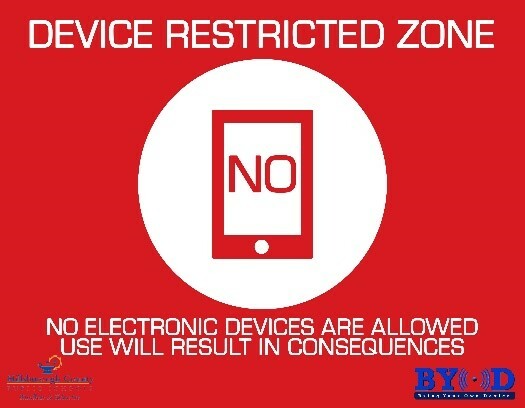 Device Restricted Zone: In a device restricted zone, electronic devices are not allowed. Devices in use may be confiscated in these areas. Return of confiscated devices are governed by the Student Handbook.